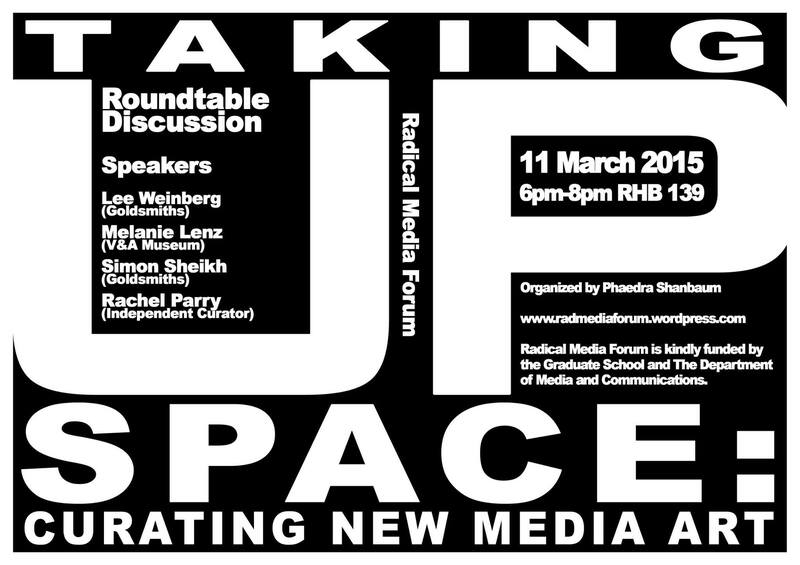 Taking Up Space is a round table event around issues with new media in museums and galleries. It will consist of a discussion of practical and theoretical concerns related to media arts curation. The aim is to invite academics, artists, curators and young researchers to share their views on a series of questions below, through short presentations followed by discussions, first between the participants, then opened to the public. Speakers include: Lee Weinberg (Goldsmiths), Melanie Lenz (Victoria and Albert Museum), Dr .Simon Sheikh (Goldsmiths), Rachel Parry (Independent Curator/Little Wolf Parade). Questions to be discussed at the curatorial roundtable include: What role does new media art play in a museum or gallery setting and how does this role feedback into and inform artistic practice and/or academic debate? When and how is new media art critical of political and cultural configurations of these institutions and to what effect? Does new media art require a different type of curatorial response from both the institution and the viewer? If so, can we use this to advance the possibility of a new type of curatorial aesthetics and what does that involve and imply? Melanie Lenz holds the dual roles of Patric Prince Curator of Digital Art (Word & Image department) and Digital Programmes Manager (Learning department) at the Victoria & Albert Museum. Her interests include early digital art practices and contemporary visual culture. She has worked on a variety of contemporary art exhibitions and digital commissions. Formerly Curatorial Fellow, Barbican Art Gallery (2006-2008), she holds a MA in Museum Studies. Publ. : Women, Art and Technology, V&A online Issue No. 6 Summer 2014; In Times of Change. An institutional perspective on collecting and conserving born-digital art, ISEA 2011. For much of its history, digital art has occupied a somewhat precarious place in critical and art historical circles. Stigmatised for its mechanistic and militaristic associations, computer art was viewed with scepticism by the mainstream art world in the 1960s and 70s. The V&A collected some early examples at the time, though curatorial staff were undeniably reluctant to engage with the new medium. I will look at what has changed, focusing on the V&A’s approach to collecting, displaying and commissioning new media art and engaging with artists. Lee Weinberg is a writer and an independent curator working in Haifa, Israel and in London. She is a practice-based PHD candidate at the Art Department, Goldsmiths, University of London. Her practice centres on the collision between traditional forms of art-representation and new media process-based contemporary art practices. Lee will discuss different aspects of her research focusing on VAINS – a repository, search and recommendation tool for navigating art-content online. VAINS was developed in collaboration with artist and programmer Dr Eleanor Dare in the past four years. The platform aims at exploring possible new curatorial methodologies in engaging with internet based artworks. More specifically, VAINS looks at how curatorial practices can use programming tools in mediating interactive digital works. The experimentation with the VAINS platform had led Dare and Weinberg to consider different aspects and issues concerning the representation of art online. These will be discussed and represented as part of this talk. Rachel Parry is a multidisciplinary artist, a practice that flows in/out of body-based Performance/Live Art and new media, she has toured extensively, nationally and internationally. Graduating from Northumbria University (2005) with a BA (hons) in Fine Art, Parry worked in various aspects of education for ten years,and recently completed a Masters in Performance Practices (2014) at De Montfort University in Leicester. Parry is an independent Producer/Curator and the driving force behind Live Art Events Company “LiveArt : ArtLive” and its showcase Art platform based in Nottingham “Little Wolf Parade”. Parry is currently working with SPILL Festival and the Pacitti Company, after being awarded a place on the New Producers Initiative. Parry will support the development of the new artists showing art 2015, London. Additionally, Parry is Artistic Director for Indie label and Promoters “I’m Not From London” and a representative for the Artist Union of England. Parry will discuss her work as a curator at Little Wolf Parade. Little Wolf Parade started with a need to create new spaces to support artists in the East Midlands, alongside hosting nationally and internationally acclaimed visiting practitioners — specifically building up artist-focused marketing strategies and support systems. Parry has innovative approaches to curating/producing ephemeral pieces of art, alongside the multitude of considerations when exploring agency. Parry is focused on methods of communication into breaking beyond the fourth wall, in both creating transformational moments for audiences, to simultaneously reach both art knowledgeable and the non-art initiated, engaging in live elements and across various online platforms.